For the most part, we use LF Black as a base layer (followed by an HF wax on race day). LF Black is most effective as a base layer when snow temperatures aren't super cold (let's say under 10f otherwise we would use LF Blue) and when the the snow is somewhat abrasive, has ice crystals in it, or contains dirt. I get asked a lot though about when to use HF Black. HF Black would make a great base layer like LF Black, like they do on the World Cup, but we don't put that on our recommendations as the difference in performance between the two as a base layer is pretty small but the price difference is meaningful. The "black" in HF Black is a shear lubricant and antistatic (conductor). You can say that is minimizes dry or mechanical friction and also enhances the "black" aspect of black bases. Generally speaking, when the snow has an element of water in it (let's say snow temperature of at least 25f) and also contains dirt, HF Black is a sure thing. It does a good job of minimizing the negative effect of the free water in the snow while also repelling dirt. The other waxes that are at all good at repelling water are softer and not nearly as good against dirt. HF Black can be mixed with other waxes too. Popular combinations include mixing with HF Blue in cold dirtier or abrasive snow that is warming up and with HF Yellow (or AX134) in wetter snow that is not totally dirty. When the snow is pretty dirt though, HF Black is good by itself. 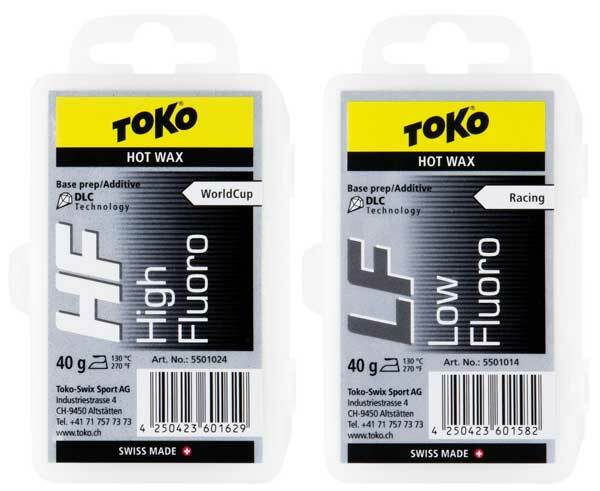 We anticipate HF Black (over LF Black) being the recommended hot wax layers for the upcoming American Birkebeiner as well as for many/most spring races. NF Black is a great training wax that is also used to "recharge" the antistatic effect of the black bases.